Desperation appears to mark the Noynoy administration in pinning down the Arroyo couple on the 2004 and 2007 election fraud, to the point of the Justice secretary and the acting Commission on Elections chairman presenting to the public some 16 election officers who today admit that they had cheated for the then administration candidates, with all of these election cheats now being covered by the government’s witness protection program (WPP). And it seems to be so easy for these poll cheating operators to get into the WPP, which is being quickly granted by Department of Justice (DoJ) Chief Leila de Lima. All they have to do is to issue affidavits stating that indeed, they had cheated for the previous administration’s candidates, and all their sins against the Filipino people are forgiven and forgotten. Malacañang and Congress should leave constitutionally well alone. In the House’s and Malacañang’s bid to save face, they now say that they won’t have the judiciary’s hiring funds impounded by the Palace and released only when hires are made. Now they say that these hiring funds will be given in full but imposed the condition that the hiring funds go to hiring and not used elsewhere, but with the judiciary now giving the Palace a report and accounting on how these funds are being spent. What is it with NATO and terrorists? In the good old days, the good guy wore the white hat and the bad cowboy wore the black hat. The good one stood for generally accepted human values defending what is acceptable in all societies, while the bad one represented what we all fear, the dark colour of his clothes representing the night, evil, fear, the Devil. And today? Telling the truth, doing the decent thing, owning up if you committed a stupid prank, showing your face if you had to represent a cause (even if it meant you were going to encounter public derision), defending women and children and working for the community by upholding the law, were all precepts upon which we were raised. In my opinion, noble precepts. Following these precepts involved knowing and obeying the letter of the law, not breaking it and accepting the consequences if you did. Fast forward to Y2K, the wonderful new Third Millennium, and where do we find ourselves? MANILA – Does silence mean yes? Is it wise to assume that what is not expressly excluded is perhaps legally included? Did the Supreme Court over-extend itself when it approved the Value–Added Tax (VAT) on toll fees, even if it was not expressly stated in law? These and other questions were probed in a meeting of the House of Representatives’ Committee on Ways and Means Tuesday, which decided to approve and consolidate the pending bills here seeking to explicitly exclude from the scope of Value-Added Tax the fees on toll roads. The Senate already has a matching bill. “We’re just awaiting the bill of the House of Representatives,” said Sen. Ralph Recto. The Supreme Court decision, which is being used by the Bureau of Internal Revenue (BIR) as basis for levying a VAT on toll fees this October, has prompted moves in the two chambers of Congress to craft a “simple” law explicitly excluding toll fees from VAT coverage. 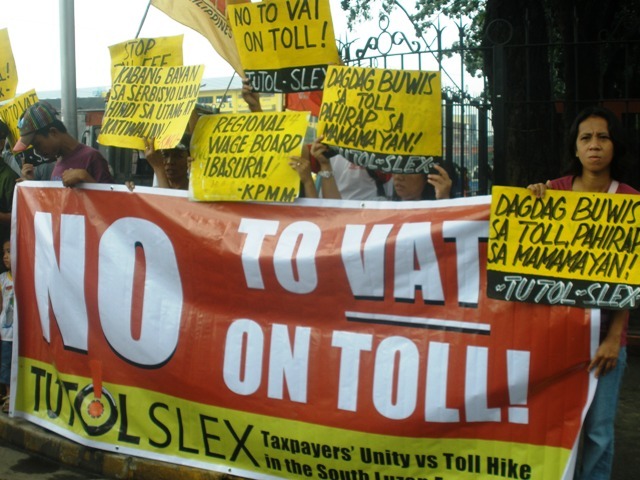 The Taxpayers’ Unity vs Toll Hikes (Tutol Slex), for example, continues to conduct protest actions in the toll booths and in Congress as they urged lawmakers to pass House Bill 5303, authored by Bayan Muna Rep. Teddy Casiño. The bill seeks to explicitly exempt from VAT coverage the fees on toll roads. On Tuesday, too, members of TutolSlex urged the Supreme Court to issue a temporary restraining order on collecting VAT on toll fees. Raw materials continue to lose their value on world markets. According to Standard & Poor's GSCI Spot index, the quotations hit the minimum level in nine months on October 3. The reduction of the prices occurs due to expectations of the economic decline, as well as owing to the decline of demand on primary goods. The growth of the Russian economy has slowed down as well. Standard & Poor's GSCI Spot, which includes the dynamics of prices on 24 kinds of raw materials, dropped by 5.38 points (0.9%) on October 3 - to 585.62 points, Bloomberg reported. During the third quarter of this year, the index has dropped by 12%. This is the largest reduction since the last three months of 2008. Investors turn their backs to commodity assets. The volume of commodity market dropped by $1.08 billion over one week ending September 28. Protective assets remain the same - gold and silver. These metals have been growing again recently. Gold lost 11% of its value in September, but it only means that the precious metal has been inflating its credentials. Investors use gold and silver as a tool for market hedge. It is good that Executive Secretary Paquito Ochoa Jr. has ordered the current Development Bank of the Philippines management to look into a number of so-called “questionable” loans granted by the previous DBP management in line with the provisions of the revised DBP charter and existing banking laws. A lot of sacred cows appear to litter President Aquino’s much-hyped straight path which was believed to be the reason behind the suspension of eight key officials of the Bureau of Customs (BoC) involved in running after known smugglers. Suspended was a group of so-called integrity auditors at the BoC who supervise the government’s Run After The Smugglers (RATS) program. The Department of Justice (DoJ), acting on Malacañang directives, ordered the suspension of Deputy Customs Commissioner Gregorio Chavez, lawyer Christopher Dy Buco, Edgar Quinones, Francisco Fernandez, Alfred Adao, Jose Elmer Velarde, Thomas Patrick Relucio and Jim Erick Acosta. Sen. Manuel “Lito” Lapid’s highly-anticipated participation in the ongoing floor debates on the controversial Reproductive Health (RH) bill finally took place yesterday and proved to be very “entertaining” not only to his colleagues but to those in the gallery and Senate beat reporters as well. His peers, who were delighted to see him engage the sponsor of the measure into debating with him, took turns in poking fun at him amid his interpellation. Senate President Juan Ponce Enrile even approached him immediately after Lapid took the floor, to shake his hand while Sen. Edgardo Angara was seen giving him a pinch on his side as the latter passed by behind him. Senate President Pro Tempore Jinggoy Ejercito Estrada braved the flooded streets to bring the much-needed relief goods to at least 2,000 distressed residents of Bulacan. The province of Bulacan is one of the most severely affected by Typhoons “Pedring” and “Quiel” which hit the Northern and Central Luzon regions last week. With his wife Precy, Estrada brought rice, canned goods and biscuits, among other food stuffs to municipalities of Calumpit and Obando, Bulacan last Monday morning. The Estrada couple had to take a military truck to reach the sites of their relief missions, one of which is an elevated portion of a street in Barangay Caniogan (the surrounding lower parts were still submerged in water). The National Labor Relations Commission (NLRC) has dismissed charges of unfair labor practices raised by PAL Employees Association (Palea) of unfair labor practice of PAL management for its alleged refusal to commence collective bargaining negotiations with the union early this year. The NLRC upheld PAL’s stand that the issue on spin-off and outsourcing should be resolved first before it proceeds to collective bargaining. The NLRC’s Special Second Division ruled that the flag carrier was not guilty of unfair labor practice as the union workers failed to prove by substantial evidence its allegation that the airline violated its duty to bargain collectively. The thrift bank Government Service Insurance System (GSIS) Family Bank is not in any financial trouble, its parent, GSIS said yesterday, adding that the state pension fund is backing its bank unit fully despite a plan to sell it off. GSIS president Robert Vergara said the GSIS plan to sell the thrift bank unit has long been conceived as part of its divestment and streamlining program. The House of Representatives acting on complaints from depositors of the GSIS thrift bank unit had held hearings to ascertain its financial health. A militant teachers’ group yesterday appealed to President Aquino to face its members and listen to their problems during the commemoration today (Oct. 5) of World Teachers’ Day. “The Alliance of Concerned Teachers (ACT) will hold nationally-coordinated activities to commemorate World Teachers Day on Oct. 5,” Benjie Valbuena, ACT vice chairman, said. Our “chalk walk and chalk talk “ with President Aquino at Malacañang is our third attempt to have a face-to-face dialog with him. Teachers hope this time, he will not miss this one important dialog on World Teachers’ Day.